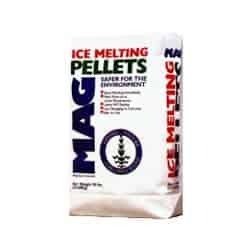 Magnesium Chloride Pellets are a premier deicer and premium ice melt product that provides the best performance while having the least impact on surrounding areas, which helps to greatly reduce the adverse effects typically associated with ice melt chemicals used to combat ice and snow hazards. 26x less concrete spalling when compared to other ice melt chemicals. Chloride content lower than competitive deicer products by at least a third. Safer for vegetation, plants, pets, and people. Less corrosive & less toxic than baking soda and even common table salt! Magnesium chloride pellets are a spherical shape and work very well with ice melt spreaders. They do tend to roll like small BBs, which in some applications is an advantage and in others, a disadvantage. The pellet or spherical shape provides performance benefits as their interface with ice and snow is more concentrated and allows them to “bore” into and down under the icy surface creating a brine underneath. This makes for easier mechanical clearing by helping to loosen the bond of ice to the surface that is being cleared. 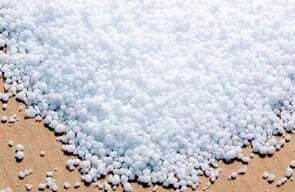 Similar to calcium chloride, magnesium chloride pellets melt ice quickly. This is because it is hygroscopic, which just means that it absorbs moisture. This helps the ice melter to dissolve into a brine faster which instigates the melting of the ice surrounding it. Unlike other ice melters, magnesium chloride ice melt leaves minimal to no residue which makes clean up easy and virtually non-existent. Magnesium chloride pellets melt ice effectively at temperatures as low as -13°F, which is considerably below most other environmentally friendly products. And it works fast – In tests at 21°F, within 15 minutes of application, Magnesium chloride pellets melted twice as much ice as rock salt.